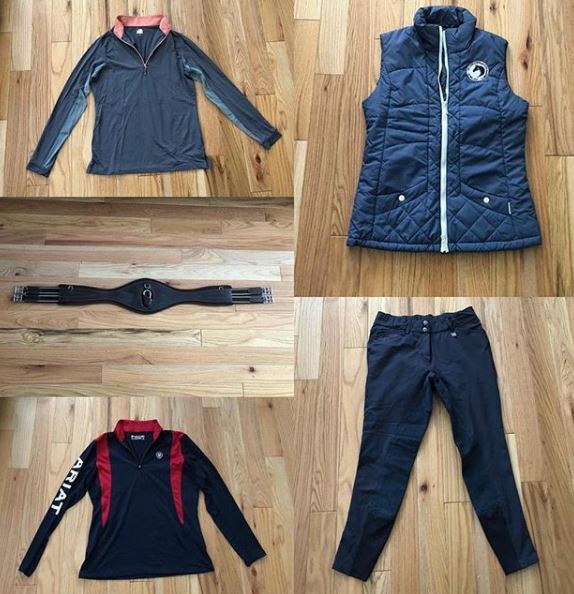 Wondering what to buy for the equestrian loved one in your life? I am incredibly excited to share my 2018 Equestrian Holiday Gift Guide! I had fun putting together a wish list in 2017, but this year’s guide is extra special, with an emphasis on small businesses. This is a selection of predominately American-made products from small businesses that I would personally LOVE to receive gifts from. Although I personally cannot vouch for many of these shops (although I wish I had tried them all! ), they have all been recommended to me by fellow equestrians. I tried hard to include prices from a variety of price points to fit everyone’s budget. This post was a labor of love and hope all of my readers enjoy it! No equestrian can ever have enough riding socks. 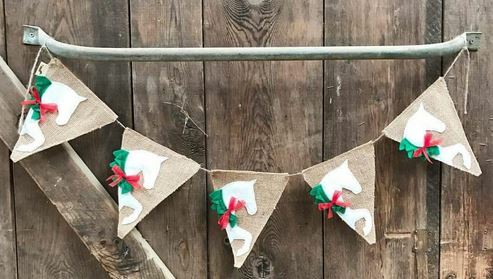 Did you stuff your equestrian loved one’s stocking with riding socks last holiday season, and now you don’t want to repeat yourself for fear of disappointment? Well you can stop thinking that right now, and go ahead and buy them more. Especially if those socks are Dreamers & Schemers, which are in my humble opinion, the best on the market. I have 3 pairs )which is not nearly enough! ), and they are the first ones I reach for every time. In today’s social media age, photography has become more prominent then ever. EVERY horse enthusiast loves to have gorgeous high-quality and artistic photos of their horse. Karinda K travels the US offering just that. Maybe your equestrian doesn’t currently have a horse of his/her own, but you know they appreciate stunning equine photography? 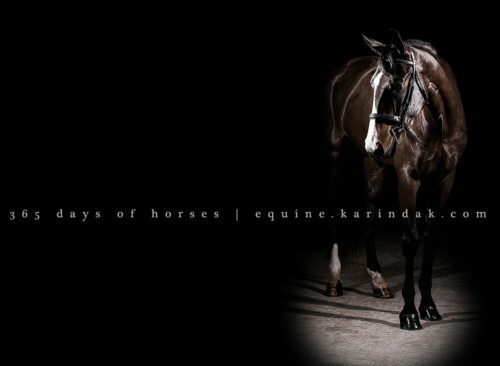 Check out Karinda’s newly launched site with jaw-dropping equine images available in every size imaginable. 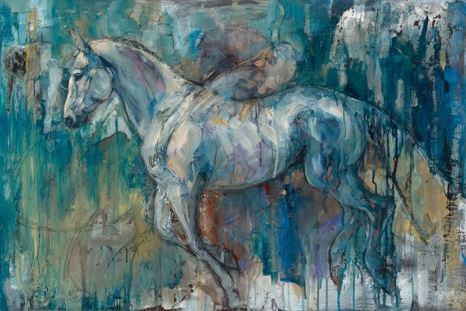 You will never hear an equestrian say that they do NOT want a custom painting of their horse. 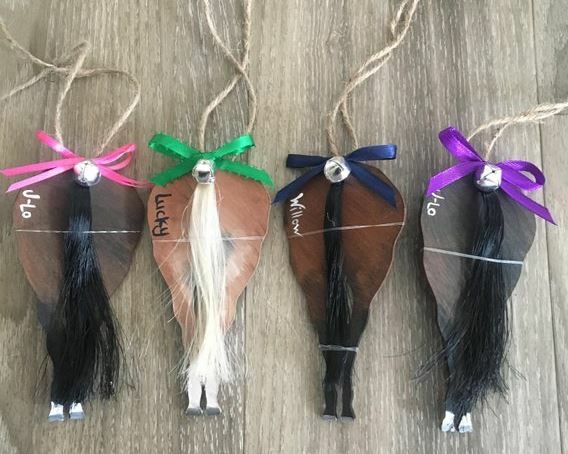 Seriously, this gift idea is sure to be a home run for any horse lover. If a custom work of art is out of the budget, Moose Pants Studio also offers gorgeous high quality prints that are sure to wow anyone with an appreciation for lovely artwork. The artist is local to DFW, Texas and I had to the opportunity to interview her earlier this year. Check it out to see more examples of her art, and for an inside glimpse into the creative process that goes into producing such beautiful images! Price: Signed and numbered paper prints start as low as $95 and custom portraits start at $475. Gift certificates are also available. When reviewing the NF.edit box I may have said that I didn’t really like the Ruespari belt that was included. Well, sometimes I have to eat my words because it has turned into one of my go-to belts in my rotation. I find myself drawn to the slim profile (perfect under show coats, no extra bulk) and chic simplicity of the belt. 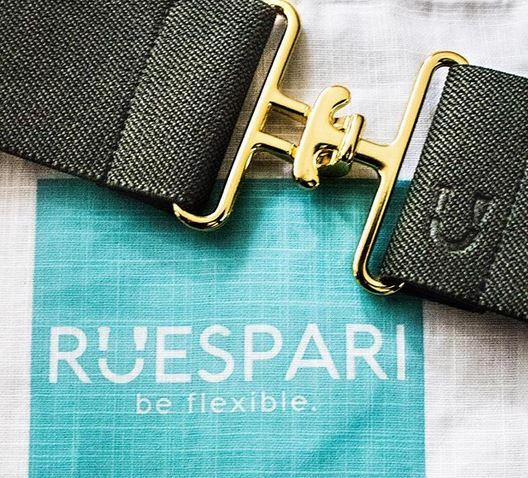 Handcrafted in the USA, the belts are made with high quality elastic fabric and hardware, and I have found the width to be great for a variety of breech styles. I seriously want like 10 more of these in a rainbow of color options. 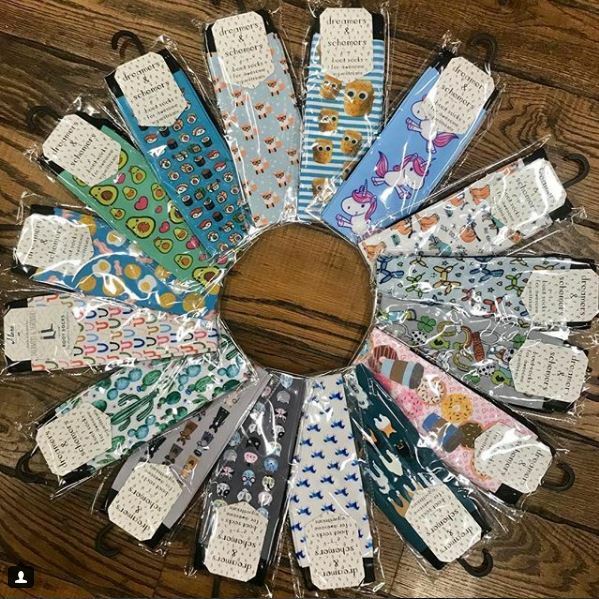 A small business that is owned and operated by a mother daughter duo outside of Pittsburgh, PA, Hunt Club offers a variety of equestrian accessories but they are primarily known for their derby belts. 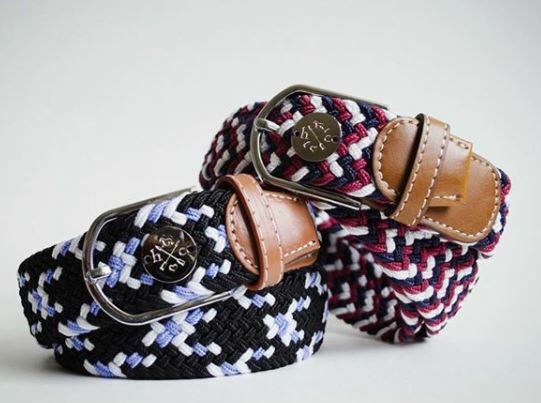 The derby belts are made from multicolored technical fabrics that are sure to thrill any recipient of them. You can never have enough of the color combos, making this is another gift that never hurts to repeat! Really really don’t know what to get a horse lover for the holidays? Don’t know any of their sizes or taste preferences at all? A subscription to Cavali Club is a great solution. 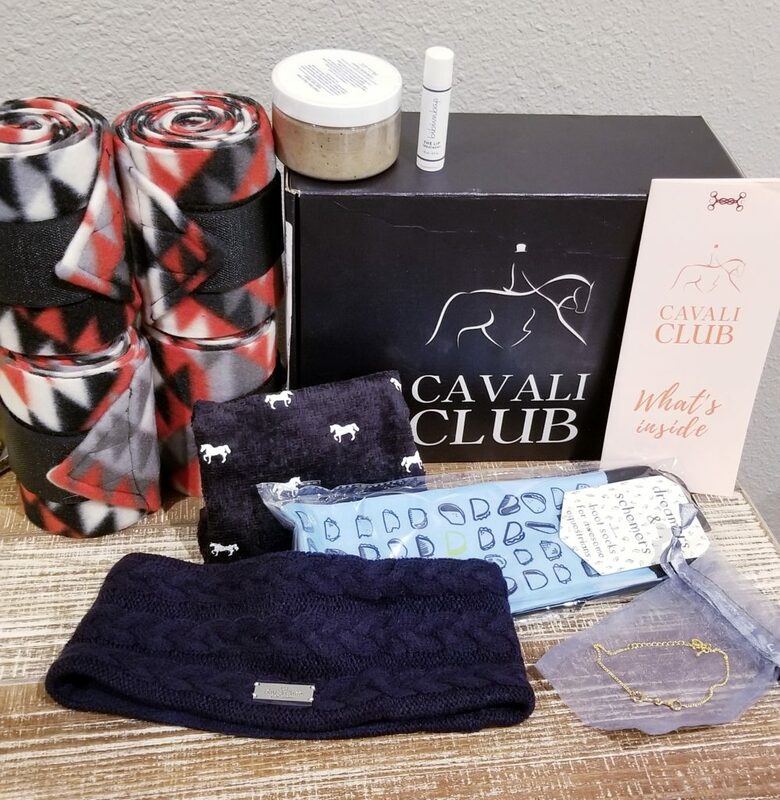 Cavali Club is a carefully curated subscription box for the discerning equestrian. Many options for whatever your price point is, you can buy a single box or an annual subscription, making it the gift that keeps on giving. Want to see what was inside the fall box? Follow the link for my review with detailed info on the included products. Hats, baby pads, decals, and adorable shirts, Circuit Style is a small equestrian boutique with products that are colorful and creative. 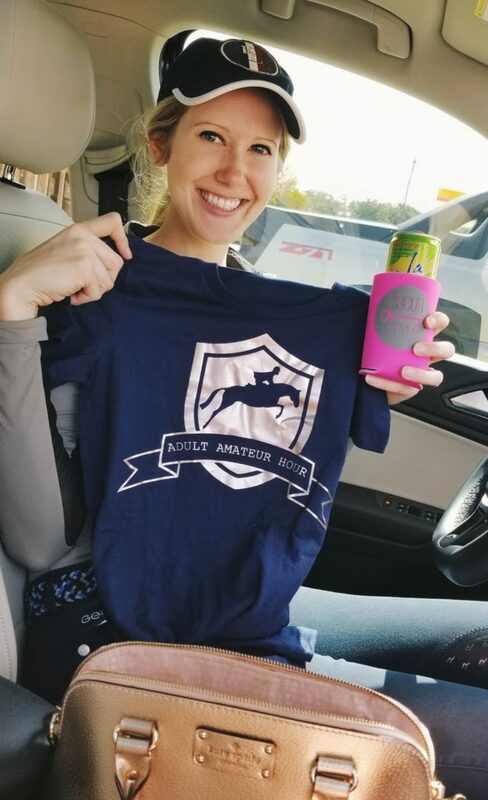 When my friend Liana gifted me with a Circuit Style tee and coozy I was absolutely tickled. Who doesn’t love a shirt with rose gold accents and a chuckle inducing slogan? Circuit Style is also known for their adorable breed logo shirts. Know that one of your best barn buddies has an imported KWPN? There’s a shirt to celebrate that at Circuit Style. American bred? That got that covered too. 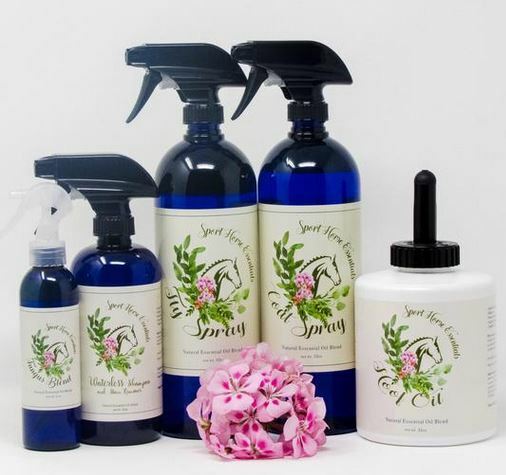 All natural grooming products with a cult following, any Sport Horse Essentials product is sure to please. Aesthetically pleasing packing and non-toxic ingredients, I’ve been wanting to try these products for ages. 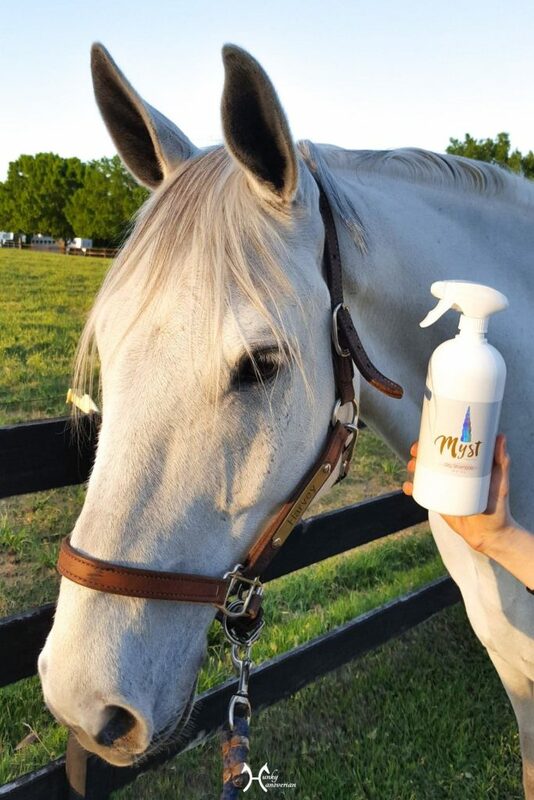 Personally recommended to be by several trusted friends, these products seem like a home run when it comes to grooming our equine best friends. Price: $16 and up, with many package and gift basket options available- perfect for gifting! Are you magnetically drawn to anything unicorn? Well, I am, and I don’t think I’m the only equestrian who is. The packaging is 100% why I decided to try Myst dry shampoo- and I’m glad I did since it works like a charm on greys and bays alike. (Full review available here). With winter coming, a dry shampoo is exactly what every rider needs in their tack trunk. 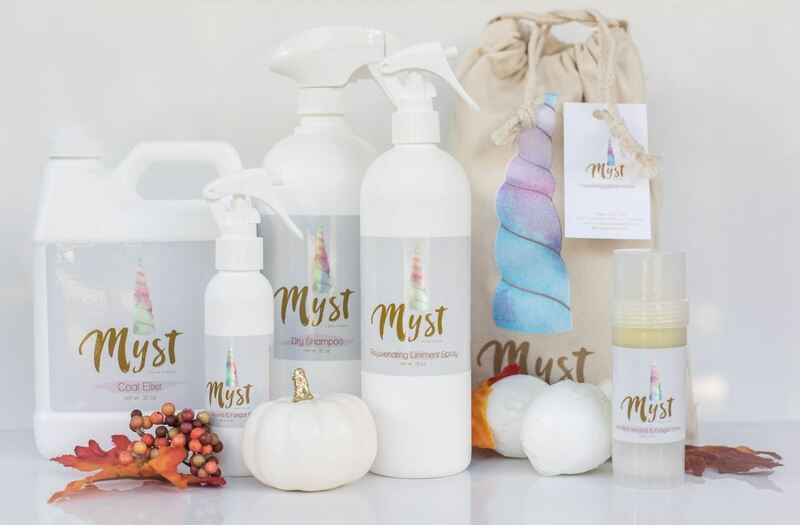 Myst also offers other grooming and first aid products. Although not personally tested, if they are anywhere as good as the dry shampoo then I know you won’t be disappointed. I also love that their website has an FAQ question about their products, so be sure to check it out if you’re on the fence. I was introduced to the Knotty Horse by a fellow rider. 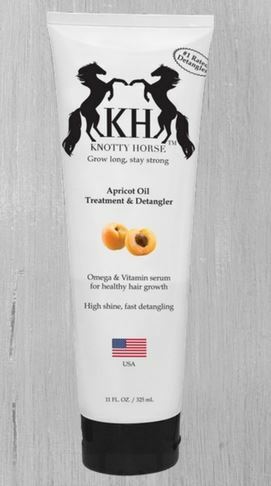 Made from apricot oil, their grooming products are all natural and made in the USA. Results are even reported to last up to 10 days! I am certainly intrigued, and know that I personally would love to support this small business and get my hands on some of their products. Also on my list last year, I’m a huge fan of Swanky Saddle. From uniquely bespoke saddle & bridle plates to on-trend & reasonably price equestrian jewelry, this shop is sure to have something for everyone on your list. Word to the wise- their shipping can be pretty slow, so if you plan to order for the holidays I would do it ASAP! 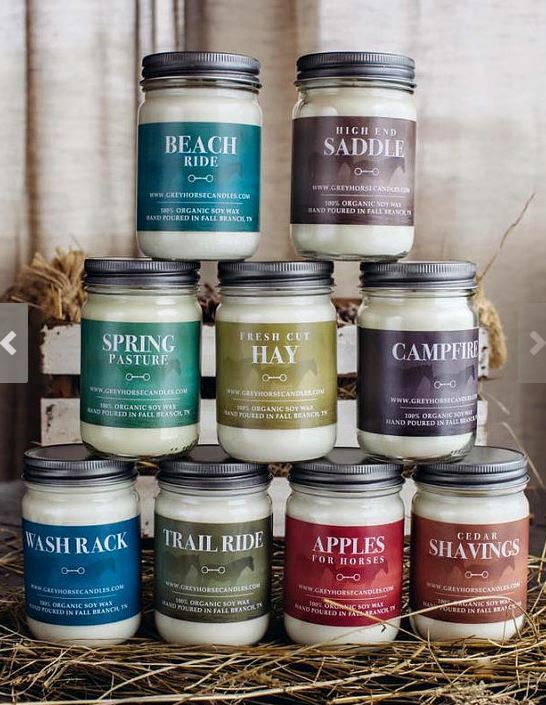 Based out of Tennessee, these American made candles have cornered the market on horsey themed candle scents. Seriously, any horse lover would love to get one of these under the tree. Spring pasture is one of my personal favorite scents, but I haven’t had a chance to try them all yet. Their Etsy shop offers soy wax tarts for your wax warmers, full size individual candles, and discounts on multiples! 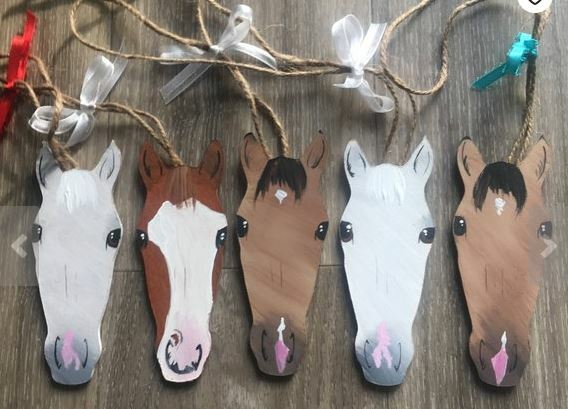 Looking to gift to a horse lover who also likes to take care of her own “turnout”? Although our horses always come first, occasionally it’s nice to take time for ourselves, and what better way to do that then by bringing our insane love of all things horse to nail polish? 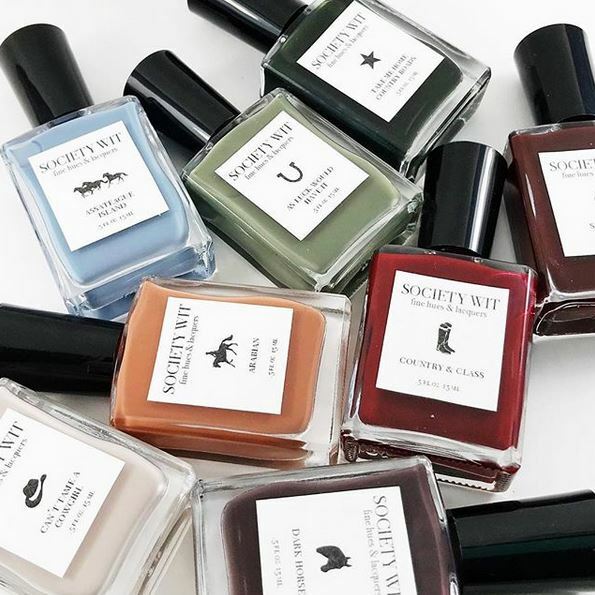 Society Wit, based out of Maryland, has done just that with their equestrian themed nail lacquer. Maybe skip this one if you’ve never seen the recipient with a manicure, otherwise it is sure to please. 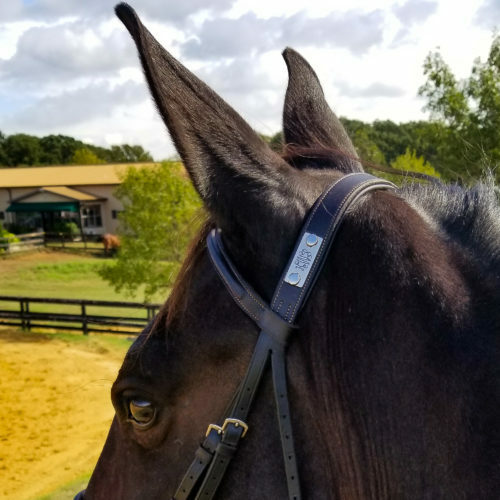 Founded by an equine veterinarian and located in the heart of the Bluegrass state, Central Kentucky Tack & Leather is my go-to shop for high quality leather halters. With the incredible price point of these halters, it’s hard to believe that they are made from premium select steer hides and are hand cut and crafted in their Kentucky shop. I’ll never go back to halters from big box stores again! Price: The turnout halter (shown on Rio), starts at $38 with no add-ons. Fancier versions with padding and even custom color padding also available! Recommended to me by a dear friend, as soon as I looked up this shop a giant “AWWWWW!” escaped me. 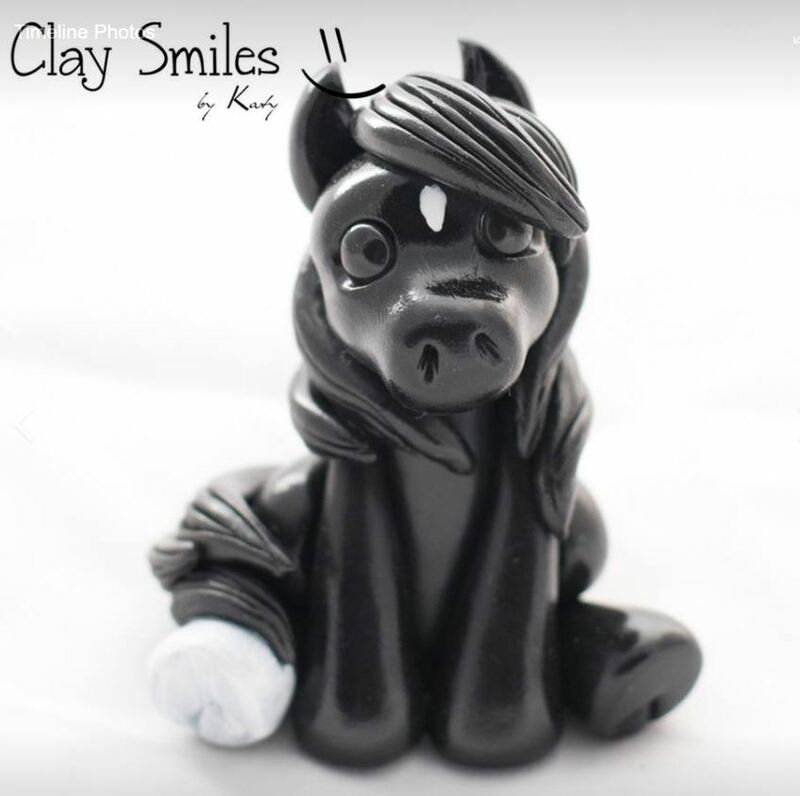 Adorable hand-crafted custom clay sculptures, this small business out of Colorado offers a product that every horse lover will treasure.They also do dogs & cats! I legit want a tiny Rio. Racking your brain trying to think of the perfect gift for your barn mates? Or are you looking for something with a custom touch for a terrific price? 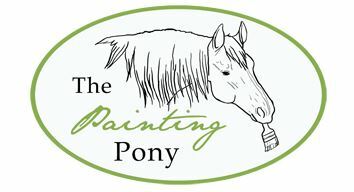 Recommend by one of my readers, check out Painted Flanks, based in Ontario! They make the CUTEST custom ornaments for an unbeatable price. Check out their Etsy shop to see all the different styles. 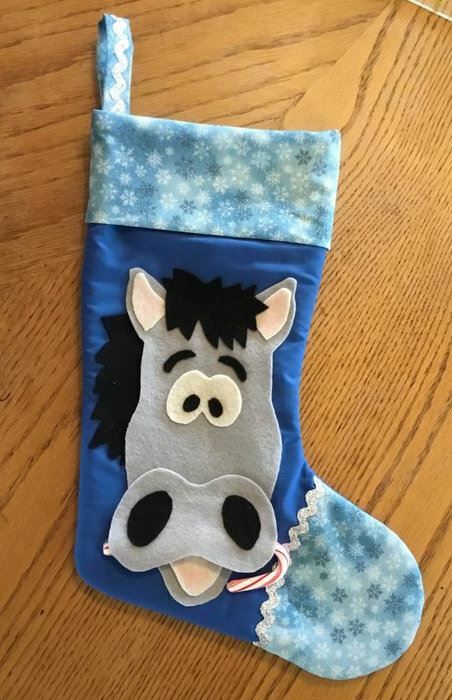 Another reader submission, this Etsy shop out of California offers smile-inducing handmade horse stockings. Get one to gift, or treat yourself and get one for each horse in your stable in your barn colors. 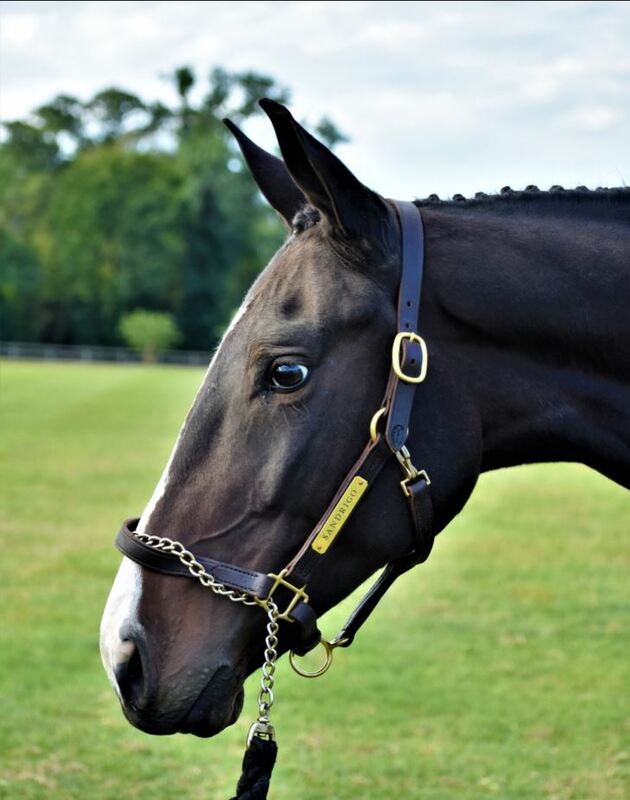 Sure to please the dressage rider or eventer in your life, Dark Jewel Designs offers stunning custom bling browbands. A limitless choice of colors, this gift is perfect if you know what color the recipient is fond of. No problem if they already have a fancy browband, variety is the spice of life after all! Helpful tip- skip this item if your recipient is a hunter rider, as we have no appreciation for color and sparkle unless it’s in the version of a shiny dapple grey! Looking to break the tack cleaning mold? 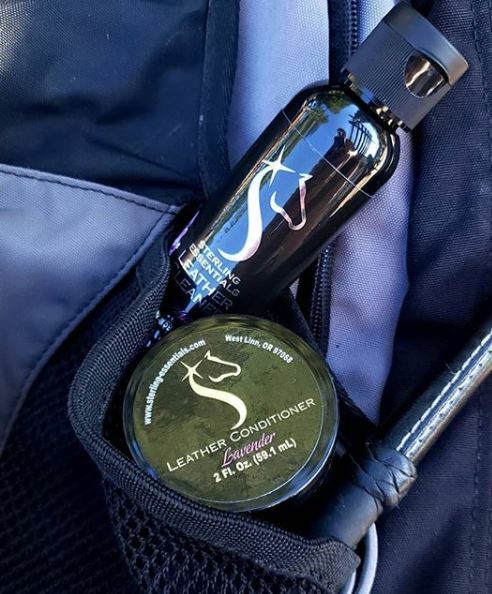 Sterling Essential leather cleaners are made with food-grade natural products and therapeutic grade essential oils in Oregon. Supported by a multitude of testimonials from top riders, these leather care products are great for all brands (yes, they are safe for your French leather!). I’ve heard tons of great things, and can’t wait to try the products out for myself. Leather cleaner that smells good? Sounds like perfection. Custom embroidery, screen printing, T-shirts, & decals, this local to Texas small business has a little bit of everything. 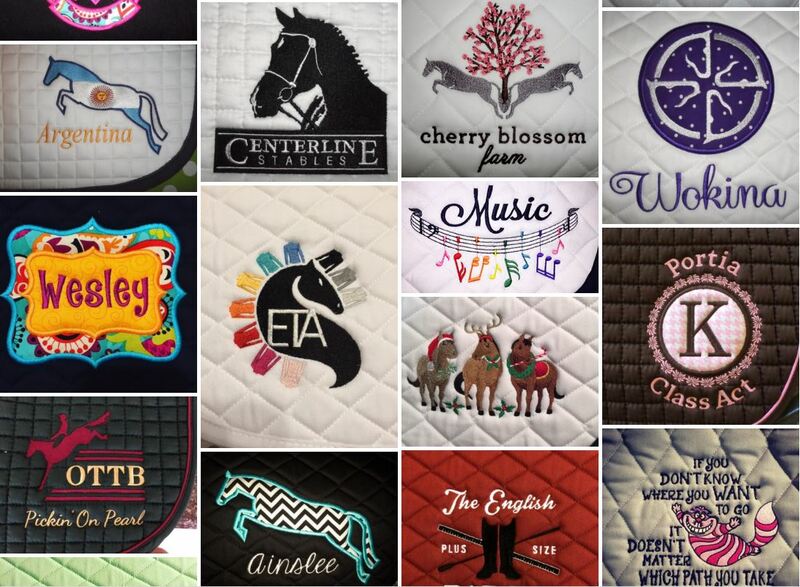 Trust when I say that all equestrians love personalized products, and no one can EVER have enough monogrammed saddle pads! Are you really hoping to blow the socks off your equestrian loved one? 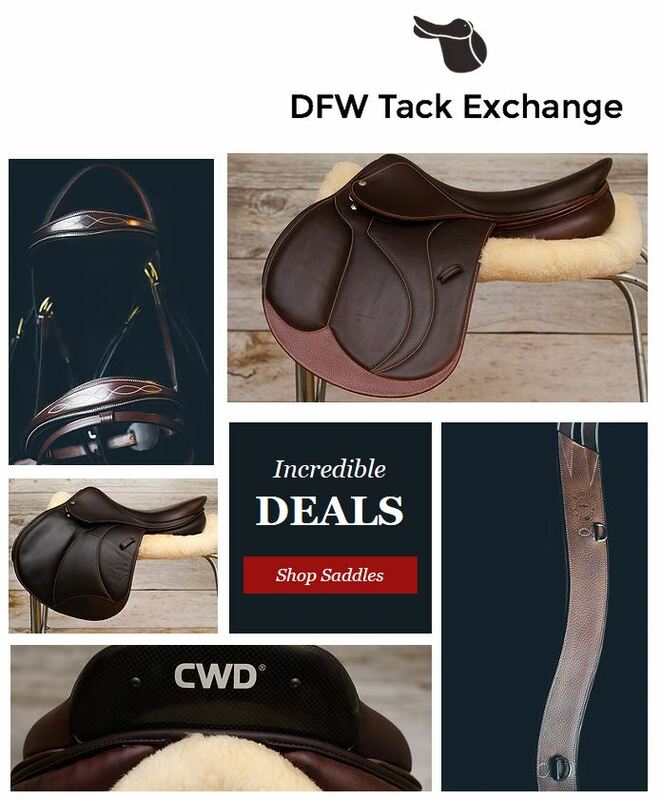 Give them the gift of fine leather and top-notch craftsmanship with an IOU to DFW Tack Exchange. With a huge variety of high-end used saddles and accessories, this gift will be a home run in any household. The owner is incredible to work with, and offers trials on all of the gorgeous saddles available to ensure a perfect fit. Looking to go new? They also work directly with Butet to create your dream saddle. Love rustic home decor with equestrian flair? Check out the handmade products at the Burlap Pony. Another reader recommendation, they offer banners, pillows, runners, and stockings, with custom options available on all items. Totes with your show series would make great show prizes, and I’d want one of the banner for any holiday celebration. 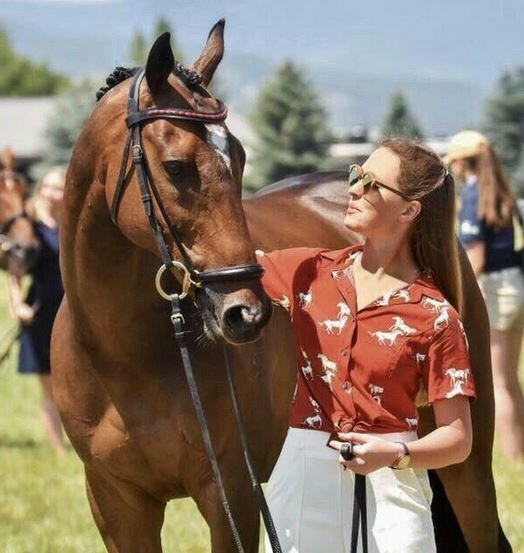 Are you trying to shop for the equestrian that seems to always looks like she walked straight out of a fashion magazine? Look no further then Street & Saddle, out of Vancouver. This clothing boutique offers apparel for the most fashionable among us, with a distinct subtle equestrian flair. This shop is an equestrian’s dream. From equestrian home decor, to custom artwork, to smaller custom gifts such as stationary, they offer something at every price paint. Based in Tennessee, I want everything from this shop from bit themed pillows to new dinnerware, and even return address labels. 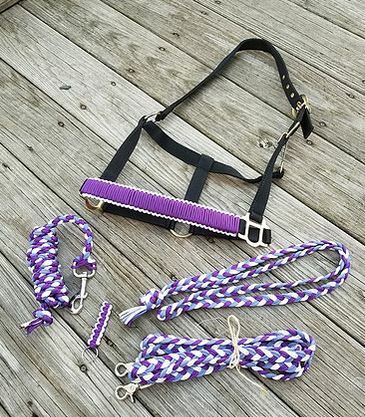 Looking for a fun & colorful twist to traditional halters? Look no further then K&T Creations. 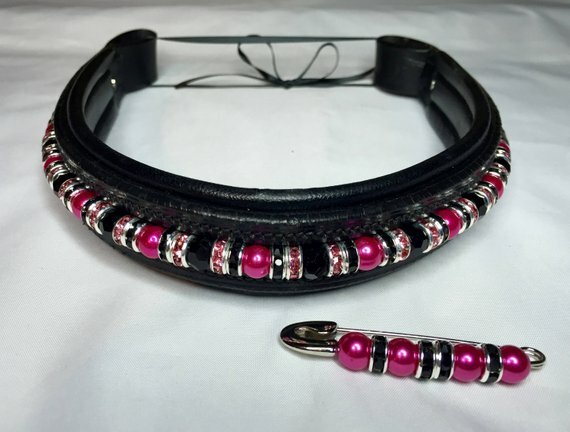 Owned & operated by a 22 year old equestrian in Pennsylvania, you can’t help but love the flair and never ending color combos of her woven noseband halters and other handmade products. Know that your gift recipient is looking for something in particular, or likes a certain brand, but it’s out of the budget? Check out BNJ Tack Sales on Instagram for a wide variety of gently pre-owned items. From Herm Sprenger bits to 5 point breast plates, to clothing of all types, BNJ Tack Sales has a quality selection at a much better price point then buying new! One of my good friends shops with BNJ all the time and has always had wonderful transactions! Have you shopped with any of these businesses? Feel free to share your shopping experience below to help out other shoppers! I hope you enjoyed my Equestrian Holiday Gift Guide, happy holiday shopping!!! 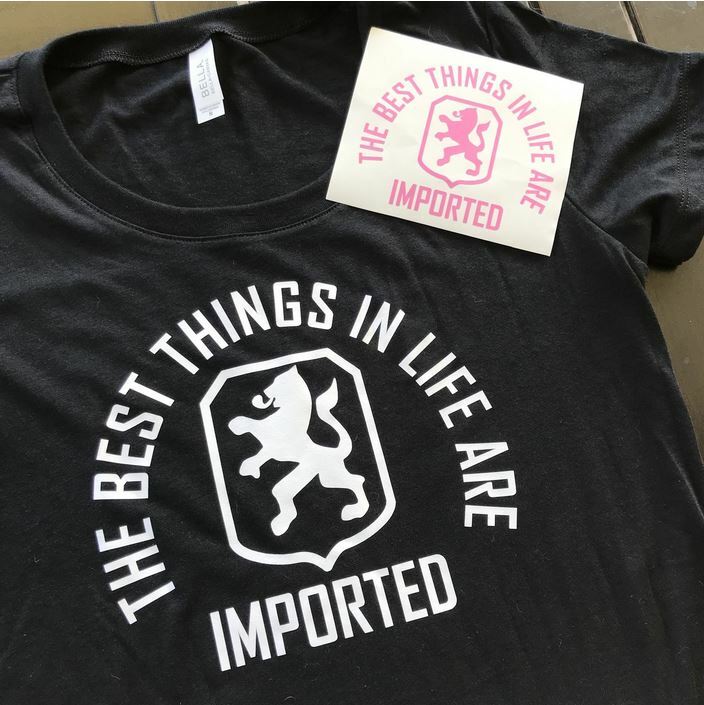 I will admit though, that “the best things in life are imported” shirt made me cringe and heavy sigh at the same time. Noooo, people! No! Haha totally understandable! They do have an awesome selection of the best things are made in America breed shirts as well! I should get the American Hano one. I have a gorgeous skirt from Street & Saddle. She’s amazing. Highly recommend her! Last year I treated myself to some cute jewellery from Swanky Saddle and had a great experience too. Shipping was a little slow, but they communicated that when I placed my order. Great list – I’m going to check out the businesses I’m not familiar with! Glad to hear from another person who loves Street & Saddle. I haven’t heard of them until a reader recommended them, and now I want all their clothes! Thanks for sharing some new small businesses. Thanks for putting this together. So funny several are based out of Tennessee! Oh my gosh, so much cute stuff! Those ceramic ponies are beyond cute! The Sterling Eessentials leather care is awesome. It takes great care of your top end leather and your hands end up soft and nice smelling. Lavender is my favorite. Lots of great and unique ideas here. Thank you for putting this together. 100% need the RUN XC shirt from Circuit Style! I haven’t heard of several of these and now I’m going to go check them all out!